The facts of Muddy Waters life are rather ideal from the blues fan's conception too. They have been told several times in some de-tail and with the inevitable deviations of accuracy, and two valuable articles on his technique have been written by Alexis Korner. (See the reference list at end of this article). Only the main points will be outlined here, as this is a more personal memoir. The seccond son of a black sharecropper, 011ie Morganfield, and his wife Berta Jones he was born in the poor and tiny black community of Rolling Fork on the Deer Creek, Mississippi. on April 4th 1915. Rolling Fork is close to the Mississippi itself and the Creek waters often washed the back porch. 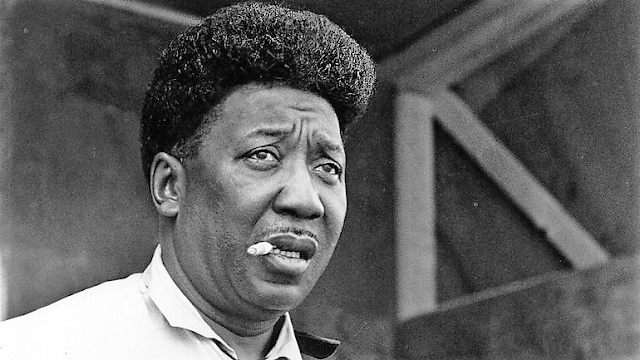 Named McKinley Morganfield, he believes that he got his nick-name of Muddy Waters from playing in the Creek at this early age. When he was three his mother died and his father sent him up-state to Clarksdale to live with his grandmother, Della Jones. He was raised in Clarksdale although he returned to stay with his father from time to time. His father played blues guitar and he first became interested from the influence of his father although he did not start to play guitar himself until he was past twenty. As a boy he learned to play harmonica and at the age of fifteen he had a small group which included Scott Bowhandle on guitar and Sonny Simms, violin. Scott Bowhandle now lives in Chicago although he. does not play guitar any more. Another boy, Lewis Fuller played mandolin and their music was in the typical country string band form. By this time he was working in the fields on the big plantations of Coahoma County, and in particular one at Stovall. He would come in-to Clarksdale at the week's end and there I was told that he gained his name from selling fish for the Saturday night fish-fries which are still a living part of the folk activities of the area. He would catch them the night before and sell them in the town the following day. One black man explained: "We say he'd 'Muddy on Friday, sell 'em on Saturday' ." At all events he had every opportunity to hear the many blues singers, guitarists' and pianists who, like him-self, flocked to the town on a Saturday. Clarksdale has a romantic appeal for the blues enthusiast who probably has little notion of its real appearance. The down-town area is pleasant, shaded with trim shops and banks. Fourth Street, the black main thoroughfare is part of a different world with low, one-storey shops and a narrow, intimate road. The shops are brick-built structures unlike the wood frame houses that comprise the black sector, stretching back through a vague maze of unpaved roads to the open country. On the fringe of the town or actually in the country itself are the juke joints, still as active as ever though the music is mainly provided by juke boxes. They are crowded, noisy, foetid and closed to white people so that we - Chris Strachwitz, my wife Valerie and myself were especially favoured in being taken, strictly against Mississippi State laws, to local juke joints. In earlier years the music was 'supplied by pianists or guitarists including the men who have become legendary in blues history - Son House, Charlie Patton, Robert Johnson. Muddy Waters heard them of course, and learned from them. Over this there has been some confusion -he was not the nephew of Robert Johnson as rumour once had it. lie did not know Robert Johnson in the sense of being a personal friend and only heard him at week-ends. Son House he knew better and tried to learn from both of them. lie considered House to be the better guitarist and singer but his style when he first recorded was closer to that of Johnson. Like everyone in the area lie knew the records that the local men made and profited from the knowledge. When John-son left the area he left in Muddy Waters a good disciple. Son louse remained and was still playing when Alan Lomax came to the area to record for the Library of Congress in 1941. Lomax was looking for Johnson and though he was disappointed in this quest he was directed to Muddy who was then working on a plant-ation at nearby Stovall. It was there that he made the historic recordings which included the two issued L of C items Country Blues and I Be's Troubled. On these Muddy played with brass rod over his little finger, vibrating it rapidly against the single strings as he fretted them, very much in Johnson's style. His singing was less similar. Walking. Blues (Vogue V 2101) is essentially the same as Country Blues and is worth close examination. On this Muddy makes great use of repetition, introducing reiterated words and phrases throughout. Against the whining string and the pronounced bass rhythm it conveys. a sense of restlessness ideally suited to the theme. His interspersed cries of "Well!" and "Now!" and his hummed notes break up the linear pattern and heighten the dramatic intensity of the performance. Muddy stayed on in Clarksdale for a while. When a company of' "Silas Green's from New Orleans" came through he joined them for a short season, playing harmonica and sometimes singing. 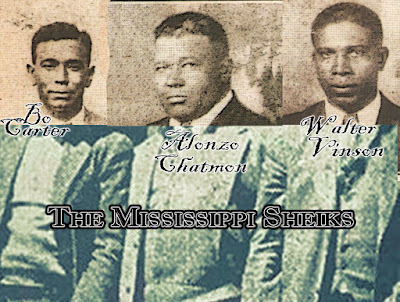 When he re-turned to Clarksdale he was unsettled and soon decided to leave for Chicago and join the many migrants from his own area who had obtained jobs there in the wartime boom, including some of his relatives. His uncle Joe Brant showed him around and he soon came to know many of the Chicago singers, and particularly those of Big; Bill Broonzy's circle. Big Bill was always extremely helpful to young singers newly arrived from the South and Muddy Waters benefited from his guidance. He greatly appreciated this and has, in his turn, helped up and coming blues singers in like manner. Under this influence he changed his style, perhaps not consciously at first but more in keeping with the Chicago trend of the immediate post-war years. He was booked into play at the famous Sylvio's on West Lake which featured singers like Sonny Boy Williamson and it was here that his reputation was really established. Eventually he was heard by a representative for the Aristocrat label and Muddy was sent for to record a couple of titles. At the time Muddy was on the road. He had worked at a paper mill when he first arrived in Chicago and later with a firm making radio parts. Then he got a job driving a truck for a venetian blind firm, and though the work was fairly heavy the hours were reasonable and allowed him time to play and sing at nights. His friend Antra Bolton took it upon himself to find Muddy in the vast-ness of Chicago's streets and actually succeeded in doing so, taking ing over Muddy's load whilst Muddy took Bolton's vehicle and drove to the studios. So Gipsy Woman and Little Anna Mae were made with Sunnyland Slim playing piano. Muddy was signed up and when Chess took over Aristocrat they took Muddy over too. It was his uncle Joe Brant who bought Muddy's first electric guitar and with its greater volume he developed a stronger form of delivery. His blues become less introverted, more aggressive but he still played the electric guitar with a brass rod on his finger and he still sang with the deep accents of his Mississippi back-ground. His themes often reflected his background too and made him a favourite with the more recently arrived migrants from the South. Muddy gathered about him a remarkable group of musicians in the course of time and during the 'fifties' he had without doubt the finest blues band in Chicago and therefore, the country. Little Walter Jacobs, a young, tough harmonica player from Louisiana who had started earning his living by playing in the streets at the age of eight and had been around so long that other singers spoke of him as if he was twice his age, formed a superb partner. Louisiana Blues displays his excellent work as an accompanist whilst Evans Shuffle is an exhilerating solo in a combination of country dance and modern rhythm. Little Walter worked in close partnership with Muddy for some five years before he cut out on his own, but he has continued to play at club dates with Muddy's band. A stalwart of several years standing was "Big" Crawford, the bass player, until his death in 1955. But the musician who has stuck closest to Muddy is Otis Spann, his pianist who is also a relative. Otis comes from Belzoni, Mississippi - one of the sultriest places I have ever visit-ed. His style is in the purest blues piano tradition, very close to Big Maceo's at times, and he sings in a restrained, sad way. When he came to England with Muddy Waters in the Autumn of 1958 he was completely unknown to blues collectors but his deeply felt playing delighted everyone. The 1958 visit was not entirely successful for Muddy, who played and sang better at clubs than on stage. He played electric guitar at the time which proved largely unacceptable to the audiences, particularly those at Leeds where he had been poorly presented by the sponsors. For a small proportion of listeners, mainly those . who were more familiar with modern trends his music was tremendously exciting, but at that time too many were disappointed in not seeing a singer fresh from the country. It is interesting how taste has changed and matured in this respect in five years. Whilst Muddy was over here his place at Smitty's Corner was taken over by Willie Nix, who considered this as his big break. Muddy had been working at Smitty's for some time and it was the real Mecca of the Chicago blues world. Smitty's was situated on the corner of 35th and Indiana Avenue, Chicago and because of its corner site and two frontages it was rather larger than most clubs. The band sat on a small stage placed in the far corner from the entrance and a brightly lit bar ran down one side. The rest of the club was entirely filled with tables -there is very little room for dancing in any of the Chicago "clubs". The noise was deafening when I visited the club on many occasions in 1960, not only from the sheer volume of sound from the band but also from the rattle of glasses, the shouts and lusty cries from the crowded room. As I entered the first time Little Walter and Jimmy Cotton were wailing in an exciting chase chorus and for some time after Little Walter, who is immensely popular, held the stand. Muddy came on late and galvanised the audience by his quite violent singing and actions. Later we heard him at the Tay May Club on West Roosevelt where he happened to be playing guitar as well as singing and we joined him in an on-the-spot broadcast in Big Bill Hill's radio show. Jimmy Rogers was not with the band at the time and the main guitar work was carried by Pat Hare. Pat Hare -christened Auburn Hare! - has a reputation for meanness and he looks perhaps twenty years older than he is. A small, very tough and rather wild man he was charming and most considerate to us - as in-deed were all the band. Muddy insisted on our coming to stay with him at his home and we had a unique opportunity of living with him and his family. Muddy has never forgotten those who have helped him and his home is proof of it. We met the ageing Joe Brant, who was called "daddy" by virtually everyone. A kindly man, he retained undiminished his enthusiasm for blues'of all styles. To our great regret he died early in 1963. Otis Spann and his family also lived in Muddy's house whilst in the basement lives St. Louis Jimmy. Through them we had a continuous blues session for days on end in St. Louis Jimmy's room, at which Roosevelt Sykes, Little Brother Montgomery, Sunnyland Slim, Otis Spann, Robert Lockwood, Jump Jackson, Little Walter, Jimmy Cotton and the rest of the band with Jimmy Oden and Muddy himself of course continually dropping into play, talk and 'drink. Muddy's house on Lake Park Boulevard is a tall, brownstone build-ing with a steep flight of stairs and a glass front door with a pair of wading cranes in cast iron somewhat incongrusously placed on it. In appearance it is similar to many of similar date in England -one could find rows of them in Brixton for example. Inside it is immaculately kept, as indeed were the homes of almost every blues singer I visited. Ornaments on the mantel, flower decorations on the T.V. and numerous family photographs give a sense of comfortable suburban living - thus, a high one by South Side standards. At the time Muddy worked on Tuesdays at the F & J Lounge in Gary, Indiana and he took Valerie, myself, St. Louis Jimmy and Joe Brant along with him in his Cadillac. The car radio was on - turned up to maximum volume as a record of Howling Wolf's came on .... turned down .... then up as J.B. Lenoir was heard, Muddy's ears detecting every blues item in the mixed bag with the radio nearly at "off". On our way to the job he talked quietly and the band was already working when we arrived. The Lounge was entirely for black steel-mill-workers and servicemen;, white people never visited it. We sat unobtrusively, but near the band and throughout the evening had a stream of interested, friendly people come up to chat with us. As the music warmed up Muddy began to comment, give encouragement, working himself up to a pitch of excitement, that made a tremendous impact when he fronted the group. There was no doubting who was king - the effect was stunning. And frightening too. The sheer physical drive of band and blues singer chilled the spine. Muddy roared, leaped, jerked in fierce and violent spasms. When he came off the stage he was in a state of near trance and the sweat poured off him. It was close on half an hour before he had unwound himself sufficiently to drive us home on the great "skyway" to Chicago, and for most of the following day he lay in a shaded room with an ice-pack on his forehead. Few people probably realise how much he gives of himself when he works and how long he needs to get over a session which generally lasts till four in the morning. For this reason no concert tour can ever give a real picture of the music of the South Side clubs, and certainly not of those where Muddy sings. Smitty's Corner closed down in 1961 - some writers still refer to it as open - and Muddy moved td Pepper's Lounge on 47th Street. The band briefly broke up but soon reorganised in essentially the same form and today plays to clubs as packed as ever. Muddy himself has been invited to sing at Carnegie Hall, at Newport and of course in Europe. After the 1963 European tour he was going back to do a college tour with Otis Spann. Some enthusiasts look on this broadening of his activities with the gloomy feeling that it will lead to diminution of the quality of his work. We can only wait and see. Touring however, has been for many years a part of his career. With his band he tours the South and in particular Alabama which he especially likes, Florida and so on but avoiding Mississippi which he has only revisited once, to see his father. On these tours he works before enormous crowds of many hundreds who pay relatively large sums of money to hear him and his band. The centres are black of course and future tours on an increasingly white circuit could alter his style and manner of presentation considerably. On the 1963 tour Muddy was represented as playing both "country" and "Chicago" with some uncertain work on an acoustic box for the former. Apart from being a second tactical error - the audience can take electric guitars now - it hardly presents Muddy as he really is today, if this is in fact possible at all on a concert tour. Muddy Waters is not yet fifty and has at least a dozen years of active blues singing ahead if all goes well. The chances that the "blues boom" will last more than a fraction of that time are probably rather slim and when the folk clubs have tired of it the blues will carry on as they have always done in the black clubs, on radio networks and records. One of the most significant figures in the blues of the post-war years. Muddy Waters is slated for immortality in the history of the music whatever the future holds. 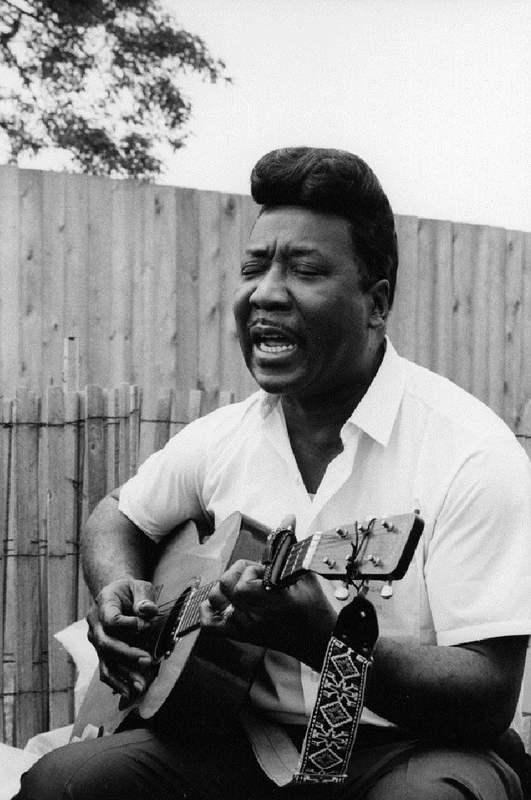 Striking in build, a little asiatic, a little of the Indian in his features with their narrow eyes and slightly one-sided smile; powerful in voice, thrilling in gesture and delivery - I have little doubt that Muddy Waters will remain in the forefront of the blues as long as he desires to be.